This may be one of our cutest coloring pages ever! The little chick is ready to go trick or treating or to the Halloween costume party wearing its Pumpkin costume – just too cute! Click on the image below to view and print full size. 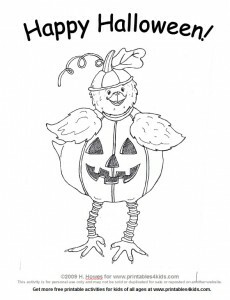 Or download the Halloween Pumpkin Costume Coloring page as a PDF file. Don’t miss our other great Halloween printables!